Tell me about your background as a pianist. I started lessons when I was about seven, but abandoned after dismal results in Grade 6 when I was about 16 (‘very poor… few correct notes’). Then there was a long interlude of not playing very much until I was in my early forties, when I resumed lessons. My technique was pretty poor in my teenage years – and suffered a gap of at least 25 years before I set about repairing the neglect, rust and general decay. How did this Chopin’s G minor Ballade project come about? For about five or six years I’ve been attending a course for amateur pianists in the Lot Valley in France. In 2010 – with Noriko Ogawa our tutor – a pianist about my standard sat down and played the G minor Ballade very well. His name was Gary, and I was simply intrigued and amazed. How could any amateur pianist possibly tackle a piece of this complexity and technical difficulty? So I started to try it for myself… and began to keep a diary. You had lessons with some well-known names in France. Was that intimidating? The courses in France have a lovely, supportive atmosphere. There are about ten people on each week, with a wide variety of standards from middling to semi-professional. We all applaud each other – and eat, drink, cycle, sunbathe and swim when not playing. So it’s not too intimidating. Anne Brain, who runs the courses, has picked some marvellous teachers over the years, and I’ve had some wonderful coaching from John Barstow, Martin Jones, Richard McMahon, Ronan O’Hora, William Fong and Noriko Ogawa. None of them too scary, though I have had moments of hand-shaking nerves on the first day. And all of them have been up for duets – or even eight hands – back at the ranch after a dinner and a few Armagnacs. 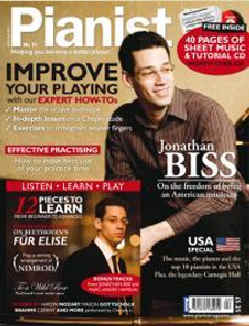 Could you have learned the piece without a teacher? I don’t think so. I simply don’t have the discipline. I have to force myself to face an external examiner every week or I just slip back into bad habits. How did you manage to find the time to practise regularly with such a colossal job as yours? I set the alarm clock to wake me up 20 minutes earlier. Evenings were a bit hopeless – either events or functions or a drink with colleagues – so mornings were the only time.